After checking in to our hotel on the 6th, including negotiating a good rate for two rooms, we needed to find some sustenance. We were at the wrong end of Myrtle Beach for many of the restaurants that family members or Trip Advisor had suggested, but we found a place that looked like it would maybe serve our needs for dinner. Though let me just say this: meeting your dining needs in the South very often means rich and/or fried food. 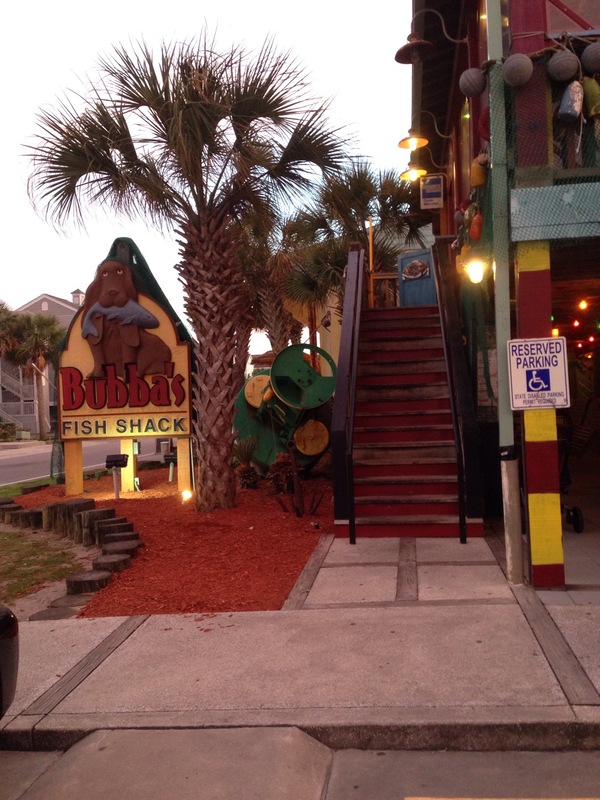 The place we picked was Bubba’s Fish Shack in Surfside Beach. It was a bit further back south than we’d have liked, but it worked out fairly well. Sadly, we found that despite having a dog on their logo, they did not allow dogs on their patio, so we had to leave the dogs in the car. Fortunately, it wasn’t that warm out, which meant the dogs would be fine, but we might not have been that comfy outdoors ourselves. We found out from our server that the restaurant had stopped allowing dogs on the patio after a dog had bitten someone. We couldn’t blame them for changing their policy. They actually did have a space outside and downstairs where people could sit with their dogs, but the weather was not amenable to sitting there this evening. I think we all enjoyed our meals. Angie ordered the peel-and-eat shrimp. Pat enjoyed catfish, which she said she liked as much as any catfish she’s had. Henry had clams, and I had fried flounder. I hadn’t really wanted fried fish, but most of the options on the menu were shellfish, which is popular in the South, but not something I eat. The flounder was good though, probably as good a serving of fried fish as I’ve had in the States. Flounder is related to plaice, which is my favorite fish for fish and chips in England. I just love the light flavor it has. It was a little disappointing to learn that none of the fish was local to the area, but it turns out Myrtle Beach doesn’t have a local fishing industry. Angie just reminded me that I also had a very good cocktail! It was called a Bay Breeze, and was one of the specials that night. This is vodka with pineapple juice (I love pineapple juice) and a splash of cranberry juice. Angie shared it with me and it was quite lovely! Breakfast the next morning was also fairly quintessential. Pat had suggested the Waffle House because it was right next to our hotel (which doesn’t start serving breakfast for guests until the start of bike week, which was actually two days away), but Angie felt we might be a little better served on the rainy morning by heading to Cracker Barrel, even though it was a bit of a drive. Pat was persuaded and after she enjoyed her breakfast, told Angie it was a good call. I don’t recall what everyone had exactly, but I do know that Henry had biscuits and gravy, which is possibly his favorite breakfast, and I had poached eggs with turkey sausage and pancakes. Angie had turkey bacon with her meal so we could both sample the different turkey offerings. Angie and I are both impressed that Cracker Barrel offers both turkey sausage and turkey bacon, which not all places offer even these days. Bob Evans even offers turkey sausage though. The turkey bacon is not as good as the Oscar Meyer that Angie and I enjoy at home, but it did grow on me. Cracker Barrel may not be haute cuisine, but you sure are made to feel welcome there. After breakfast, Angie, Pat and Henry took the dogs to a dog wash to clean off the grime of two weeks of camping. They stopped on the way back to pick up some salad at a salad-to-go place. The salads were decent but overpriced for what we got. By dinner time we were ready for something different but our efforts to find something a bit more eclectic proved to be rather challenging. Pat and Henry had taken the car to go to dinner, which meant that Angie and I were limited to places that would deliver. We thought we’d found a good Thai place, but we were out of their delivery area, so we ended up ordering pizza, though at least it was a little different. We ordered from a place called Mama Mia’s, which turned out to be at the end of our street, and their offerings were a little unconventional. Angie ordered the Buddha Pie, which was a Thai chicken offering, and I had the Gladiator, which had steak and spinach (both good). It really wasn’t our first choice, but it was a satisfactory dinner.